in response to a judge ruling that code is "execution" not free speech (the same way an assassination is not free speech). [...] Algorithms are not neutral formal procedures. [...] Algorithms themselves are animated: they induce movement between inputs and outputs, and are themselves caught up in diagonal movements between biological knowledge and property value, movements characteristic of the new media biotechnology economy. [...] More generally, code as expression and code as action never coincide fully. 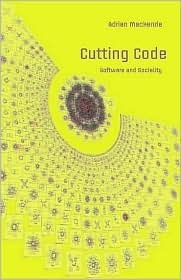 In terms of the software ontology explored here, code, the material that lies at the core of software, is unstable because it is both expression and action, neither of which are materially nor socially stable. In saying something, code also does something, but never exactly what it says, despite all its intricate formality.